register for Asbestos Containing Materials. Covering the Nation With consultants available across the UK, we make sure you receive the personal service required. Looking for Asbestos Survey Companies? We are industry leading consultants, protecting you and the environment since the turn of the millennia. With offices based in Oxfordshire, Northamptonshire, Yorkshire and Kent, Amiantus can provide accredited surveyors to carry out Asbestos Management or Refurbishment & Demolition Asbestos Surveys throughout the UK. All our surveys and sampling techniques for Asbestos Containing Materials are carried out in accordance with the requirements of the Health and Safety Executive Guidance document HSG 264 Asbestos: The Survey Guide. All samples obtained are analysed in our onsite laboratory which is UKAS accredited to ISO17025 for Polarised Microscopy Analysis for asbestos in bulk samples. On completion of your survey a bound, full colour report will be issued along with a pdf copy. Each report will include an asbestos register, asbestos risk assessments, recommended actions and floor plans. The report will assist you in forming the basis of an effective plan to manage asbestos. Successful management of Asbestos Containing Materials is based on effective identification, inspection and the implementation of an effective management program. Working alongside your own staff, we can review your existing management plan and risk assessments and update your records with any noted deterioration, or further asbestos which has been revealed since the original survey. We provide a national coverage for all our services, including – London, Surrey, Hampshire, Buckinghamshire, Berkshire and wider UK regions. Results turned around in half a day in our UKAS on-site lab. As a dedicated Asbestos Survey and Testing company our services are completely independent. We offer a fixed price service which includes all samples taken for analysis in our UKAS Accredited Laboratory and a full report with an asbestos register, risk assessments, floor plans and recommendations for your asbestos management plan. We have locations across the UK, Amiantus managed to deliver survey reports and analysis results in less than a week, 100% recommended. 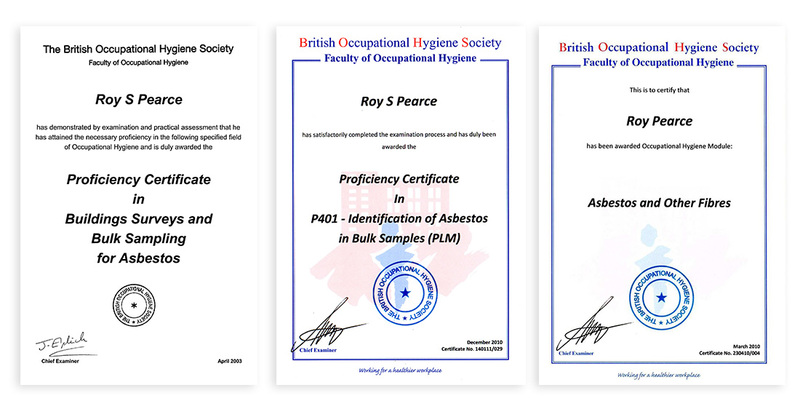 Our Accreditation’s To make sure that we only provide the safest and highest standard of Asbestos Surveys and Asbestos Testing, all of our consultants and analysts undergo regular and intensive training from all the relevant industry bodies.